Less than 200 militants of Daesh (banned in Russia) terror group are still in Mosul as Iraqi forces prepare for a decisive storming of the city center, media reported Saturday, citing military sources. MOSCOW (Sputnik) – On Thursday, Iraqi Prime Minister Haider Abadi said Mosul was likely to be cleared of terrorists within days. "The Daesh occupies only 500 square meters [approximately 5,382 square feet ] in the center of the old city, where no more than 200 radicals, including snipers and suicide attackers, are staying," the sources said, as quoted by the Al Arabiya broadcaster. 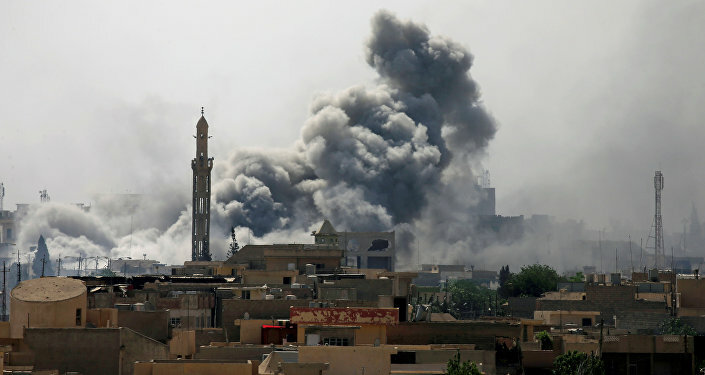 The broadcaster noted that the Iraqi forces from various structures, including elite anti-terror units, are deployed near the landmark al-Nuri mosque, which was reported Wednesday to have been blown up by the Daesh militants. Mosul has served as the Daesh headquarters in Iraq since the group's invasion from Syria in 2014. On February 18, Abadi announced the start of operations to liberate the city. Iraqi and the US-led coalition forces freed its the eastern part in late January 2017, with fighting is now ongoing to complete the liberation.